Choosing your annual holiday destination is a tricky decision at the best of times, but it becomes near impossible when you’re working with a limited budget. You want the best possible experience, spending the least amount of money. Plus, you want to enjoy yourself when you’re away – fine dining, fun adventures, boozy nights out, the lot! Luckily for you, we’ve teamed up with travel comparison site, Compare and Choose to bring you five of the cheapest holiday destinations in Europe. Located on the Bulgaria’s Black Sea Coast, Sunny Beach is a lively resort known for its sandy beaches and bargain booze. With the cost of a pint averaging at a humble £0.87, there’s know questioning why this seaside destination is a hit with British holiday makers. If you want more from your holiday then a cheap pint, then you’re in luck. A mere 15-minute drive from the party centre, you’ll find Nessebar, a UNESCO listed historical town with a unique combination of Greek and Roman architecture. Despite the alcohol prices averaging at a higher £1.69 per pint, Portugal’s stunning Algarve is becoming a go-to destination for budget holiday makers, due to the discounted cost of flights and accommodation. The Southernmost region of Portugal, The Algarve is known for its hot climate and secluded beaches lined with towering limestone cliffs and coves. Most airlines will fly into Faro, a quiet alternative to the nearby Albufeira, which offers a much more vibrant nightlife. Nestled between the lesser known regions of Costa de la Luz and the Costa Tropical, Costa del Sol is a firm favourite for British tourists. It’s beautiful beaches and clear blue waters are made even more dazzling by the mountainous backdrop that frames the horizon. If you manage to part with the coast, a trip up to Andalucia is a must. Here, you’ll find stunning villages of whitewashed houses rolling down the hills. A small island off the North-West cost in the Lonian Sea, identified by its mountainous shorelines and beach front architecture, Corfu has a lot to offer. Everything from endless white-sand beaches to mythical resorts. It is a tourist hot spot, so you can get an all-inclusive package for pennies, if you book in advance. Plus, you’ll get to enjoy all the Greek cuisine you can eat! Our only non-beach location, Prague offers a unique city break with a low-price tag and arguably, the best beer in Europe. Without a beach to kick-back and relax on, you’ll have plenty time to explore the architecture this historic city has on offer. 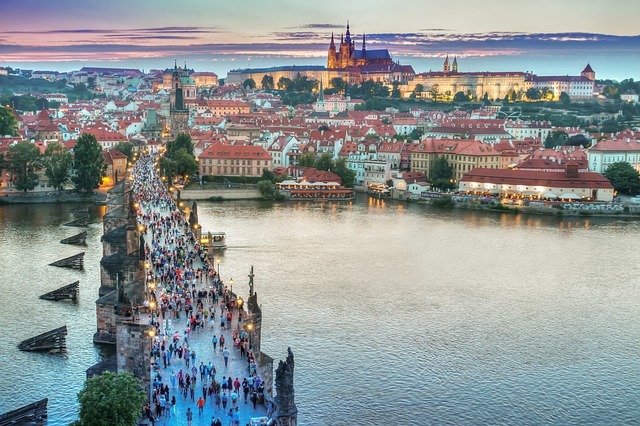 Take a walk to the old-town square and enjoy the market stalls, explore the cities ancient castle, or take a photo on the Charles Bridge.